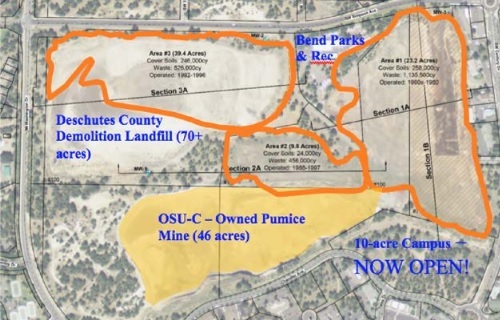 BEND, OR -- Deschutes County is moving forward with plans to sell the former demolition landfill to OSU-Cascades for expansion of its existing Bend campus. County Commissioners agreed to a sale and purchase agreement Monday. County property management specialist James Lewis explained the deal to Commissioners: "The sale price of the property would be $1. And, the $1 sale price is based on the fact that the estimated remediation cost is substantially more than the appraised value; to the tune of approximately $13 million." He said, after a letter of intent was signed by the county and university in August 2015, experts began researching how much it would cost to clean up the property. "They came up with a cost for remediation, an estimated cost of $43.3 million. During that same period, there were two appraisals that were done for the property – one by Oregon State University and one by the county. The higher of the two appraisals was $30 million. So, there was a $13.3 million gap between the estimated cost for remediation and the appraised value." The 72-acre site was used for the disposal of construction material and Commissioners said keeping it would soon create a liability for the county. Commissioner Phil Henderson opposed the sale agreement, citing concerns about the property's future if Oregon State University doesn’t receive needed funding from the Legislature to expand the Bend campus. Commissioner Tammy Baney voted for the deal, saying it supports the region's only four-year university, "This is an opportunity for us to also partner with businesses to be able to have a skilled workforce, to make sure that intellectual capital stays in our community." Commissioner Tony DeBone said this was the best possible outcome for an otherwise unusable parcel, "I know at one point we were looking for, ‘let’s find examples of repurposing a landfill in the west or in Oregon,’ and they’re just not out there. So, we’re doing the best we can with the information we have."